Is there a grouchy German in your world? 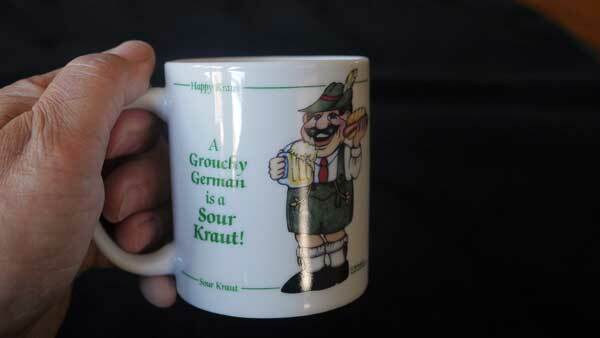 Why not make their day a little happier with this fun “A Grouchy German is a Sour Kraut” Coffee Mug? This standard sized coffee mug is 3 3/4 inches tall, and holds about 8 oz. of your favorite beverage. Fully decorated! Both the front and the back of the mug feature a happy looking German man holding a beer stein in one hand and a sausage on a roll in the other, along with the words, ” A Grouchy German is a Sour Kraut”. The line at the top says, “Happy Kraut”, and the line on the bottom of the mug says “Sour Kraut”. Inside the mug is an image of that Happy Kraut! The handle says Grouchy German. 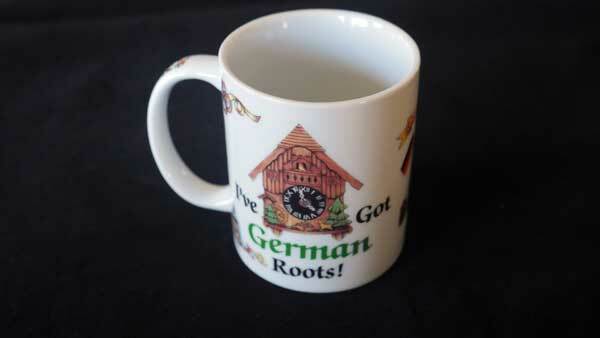 One of our many great German Gifts Ideas!